That’s a somewhat non-specific question. And sometimes patients use the word Juvederm to mean all sorts of fillers. And the answer is yes, we have Juvederm in our Modesto office. As of the writing of this Modesto Botox blog, we have all the different Juvederm which is available in USA. First of all, how do you spell Juviderm? You need to have it all in caps and that fancy É and you need to trademark symbol. That’s how it’s spelled correctly. So I guess everyone for the most part spells it incorrectly. So “Juviderm” is fine too. Juvederm is like Calvin Klein. What? So do you have Calvin Klein? Well, it’s not exactly like that either. Perhaps I should try to explain. Juvederm is a family of fillers with varying properties. They have different thickenesses, different size needles which come in the packaging, different duration, different indications, and of course injectors will have different preferences. The empty boxes of the dermal fillers. 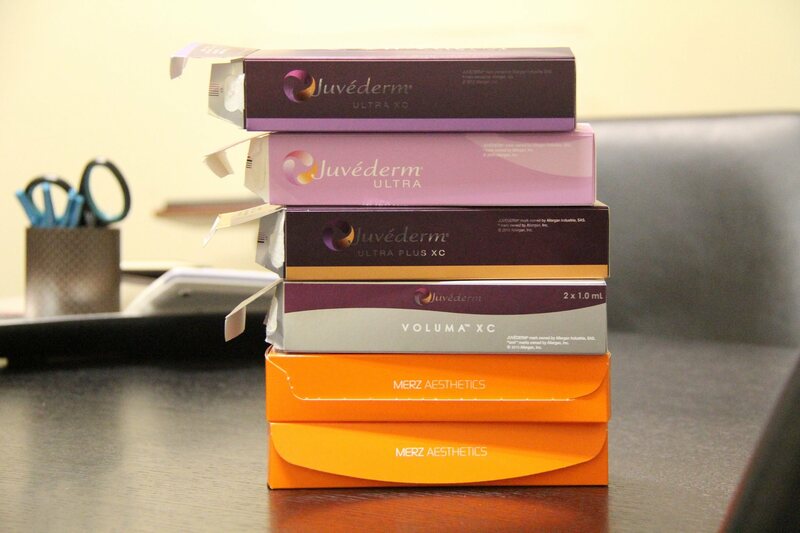 Juvederm boxes up on top. There are two syringes of Juvederm in each of the Juvederm boxes. Juvederm has different names, and outside of the USA there are many other variations of Juvederm. Many of which I’ve not tried nor do I even know about (yet). 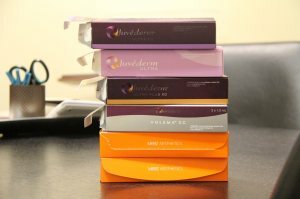 I pretty much the entire collection of Juvederm products available in the United States in my Modesto Botox/Juvederm practice: Surgical Artistry. My wife (board certified plastic surgeon, Dr. Tammy Wu), and I feel that the entire range of products are necessary for obtaining the desired results. With the different Juvederm products, we feel that we can achieve different outcomes and for different skin thicknesses. They are made by Allergan. The XC products have lidocaine added inside. Some patients might be allergic to lidocaine or may approach a toxic dose of lidocaine with too many syringes selected; thus a non-lidocaine version of the product may become more desirable. The products above are listed in general from thickest to thinnest. Read my blog about the relative thicknesses of dermal fillers. There’s a whole world of folks arguing about the terms thickness, viscosity, G-prime, compressibility, lifting capacity, etc. I understand some of the subtle differences. But “thickness” is a simple way to look at it. And XC probably stands for Xylocaine, or perhaps it stands for extra comfort? I’m not sure, but perhaps it’ll be for the patients to decide – especially if they say, “that didn’t hurt at all, doctor!” Music to my ears. Although Lidocaine may rhyme with Candy Cane. It’s not Candy. Feel free to read my blog about toxic doses of lidocaine and how to calculate an estimation of safe limits of lidocaine; and there is a discussion of central nervous system adverse effects: nervousness, tingling around mouth, tinnitus, tremor, dizziness, blurred vision, seizures, depression, loss of consciousness. and a host of other products – mostly related to eye care. And Allergan is going to be merging with Actavis.